This is the fifth of 7 “scenes” depicting each of the pieces of the armour mentioned by the apostle Paul. Putting on the whole armour of God protects us in the battles of life & faith. I used some reference photographs from the internet to help me draw this Roman helmet. I imagine the apostle Paul looking at his Roman soldier captors whilst he was in prison, & getting the ideas for the various pieces of the Armour of God from observing the Roman arms & armour before him. Thus it seemed right to illustrate a Roman helmet for this piece of equipment. I enjoyed colouring up this illustration & applying brush textures to it to represent the smooth, hammered, curved, polished reflective metal of the helmet. I like the grey iron/steel with the yellow accent metal edges. Helmet of Salvation: what is it & what’s it for? The leather (& in later history) metal helmet is fashioned, designed & manufactured to protect a soldier’s head & neck. Without it, a soldier would be vulnerable to assault to his head from enemy weapons. Indeed, without a helmet an enemy soldier might aim his blows at the unprotected head. 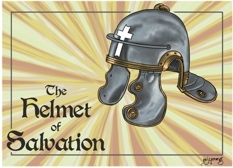 Application: why a Helmet of Salvation? 1) The Helmet of (our) Salvation provides assurance & a sense of safety. The Lord God intends us to remain confident, & well protected, in all our skirmishes with spiritual powers & dark forces of this world. 2) Our protection is present & future: we can be assured that our Salvation is ever-lasting, coming in to effect the moment we become a Christian, & lasting for all eternity. 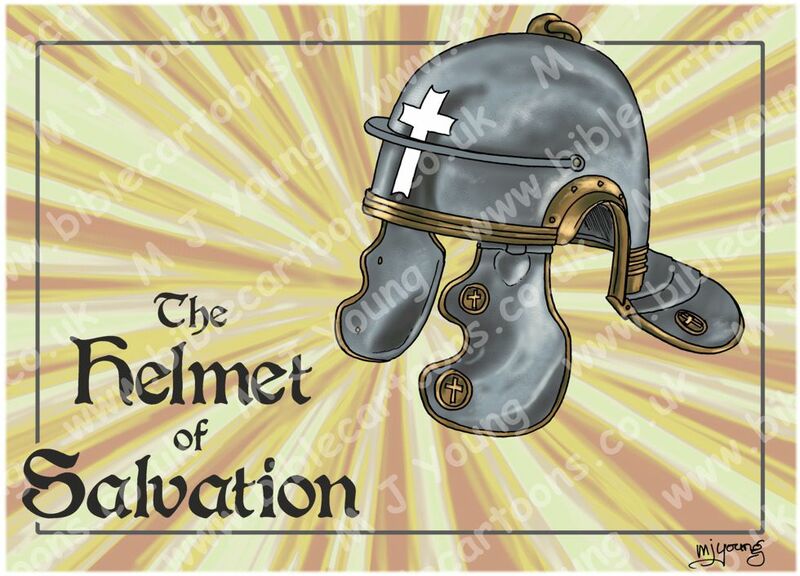 3) The Helmet of (our) Salvation reminds us that the battle is a spiritual one: the focus of which is often our minds. The enemy (Satan) knows that if he can influence our minds he can alter the course of our lives, hoping to lead us down false trails & into sin. The fact that our battleground is predominantly a mental one is why we are told (in Romans 12:2 ) to renew our minds, which we do by reading scripture, prayer & meditation on the Bible. The Lord God knows that our behaviour comes from our thinking & so changing our thinking will change our behaviour, for our good & His glory. 15b The Lord looked and was displeased to find there was no justice. 16 He was amazed to see that no one intervened to help the oppressed. So he himself stepped in to save them with his strong arm, and his justice sustained him. 17 He put on righteousness as his body armor and placed the helmet of salvation on his head. He clothed himself with a robe of vengeance and wrapped himself in a cloak of divine passion. 2 Don’t copy the behaviour and customs of this world, but let God transform you into a new person by changing the way you think. Then you will learn to know God’s will for you, which is good and pleasing and perfect.